Are DU Packages Good Enough for VoIP termination in the UAE? The United Arab Emirates are interesting for many terminators, since this country has enormous volumes of international traffic. First, the state is a major exporter of oil and gas, and secondly, the UAE attracts a lot of foreign investment. In addition, a host of tourists visits the country every year. About 15 million foreigners visited it in 2013 alone. With the average call termination rates of $0.11 per minute, entrepreneurs are able to make stable earnings landing the international GSM traffic. By the end of 2015, the UAE population was more than 9 million people. The level of mobile penetration in the country is about 230%, that is, the locals use several SIM-cards for calls. Such coverage of GSM communication in the UAE is an opportunity for terminators to have the maximum amount of traffic paid off and get a solid profit. Two major mobile operators in the UAE are Etisalat and DU. Etisalat has long been a monopolist in the market, the number of its subscribers has reached more than 8 million and continues to grow. DU operator is also very popular. Its subscriber base is over 7 million people. Local cellular communication in the United Arab Emirates is not that cheap as in African countries. 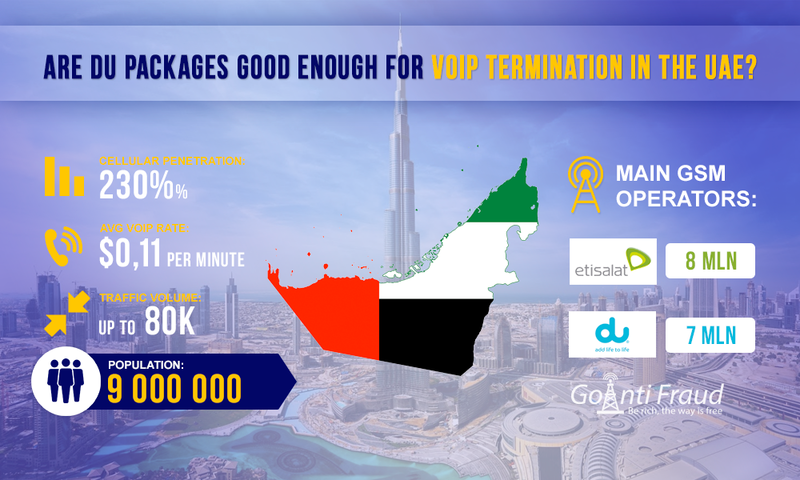 With the average call termination rates UAE of $0.11, it is important to choose the best package for VoIP termination. DU SIM-cards, thanks to a large subscriber base, at first glance, are suitable for the landing of international calls. In addition, the provider offers prepaid tariff plans. The SIM-card itself is quite expensive - about $45. The United Arab Emirates is not too loyal to the termination, and generally to IP technology as they are blocking even Skype. Therefore, we must be prepared that SIM-cards will be quickly blocked. It is important to provide a reliable protection against AntiFraud systems. Tourist Plan. 20 free minutes to call any numbers for $15. After the bonuses are expired, the price per minute is $0.16. Pay As You Go. 35 free minutes for $6.81, 75 minutes for $13.62, 150 minutes for $27.23 or 300 minutes for $54.46. National Minutes Pack. For $0.27 a day you will receive 5 free minutes for local calls. If we calculate the cost of a minute, in the first case it is $0.75, while you are using the free minutes. However, there are only 20 of these minutes, and it is inappropriate to insert a new SIM-card every twenty minutes. If you terminate at the rate of $0.16 a minute after using bonuses, it will also be expensive (about $0.3 a minute). When you choose to use the Pay As You Go package, a minute will cost you $0.18, not to mention the cost of new SIM-cards every week (with an average 7-day lifespan of SIM-cards). National Minutes Pack package provides $ 0.05 per minute. It's cheap, but 5 minutes are very little for the GSM termination business. As you can see, DU packages are not too favorable for the gateway gsm goip owner. High tariffs for calls within the country and the high price of SIM-card do not allow for a profit. We recommend using Etisalat packages for the termination of the UAE, about which you can read here.